first down pillow that I haven't had to continually fluff to be comfortable. Ideal for outstanding rest and rejuvenating sleep, these down pillows feature an extra-firm design that's incredibly supportive while also maintaining a plush and comfortable feel. Made with luxurious 230-thread count cotton, these extraordinary pillows are filled with rich 600-fill power goose down that cradles your head and helps to promote optimum sleep temperature. There are enough positive reviews here that I might not have written this review but I felt I needed to counter a couple of negative reviews I read. When I fist got the pillow unboxed I placed it in my dryer for about 15 minutes on air dry just to tumble it. You should do this on a regular basis with any down/feather pillow,it completely re-fluffs it. This restored the pillow from its squished state due to shipping. It also got rid of any smell that might have existed. I actually didn't smell anything from the beginning. Also someone mentioned the "minimum 75%" down label on the pillow. I've had more expensive all down pillows from different manufacturers and this is what they all have on their labels. I believe that's a legal requirement, I don't think they can use 100% even though that's what they are. The pillows that are some combo of down and feathers must state that on the label, and in my experience they all do. As far as I can tell this pillow is 100% down. I use down pillows exclusively because I have several bad cervical disks in my neck and can wind up with severe pain and headaches if I sleep incorrectly. I am most comfortable with firm down pillows that don't allow my head to completely sink through the pillow. After much trial and error I've found that "firm" can be defined quite differently by various manufacturers. 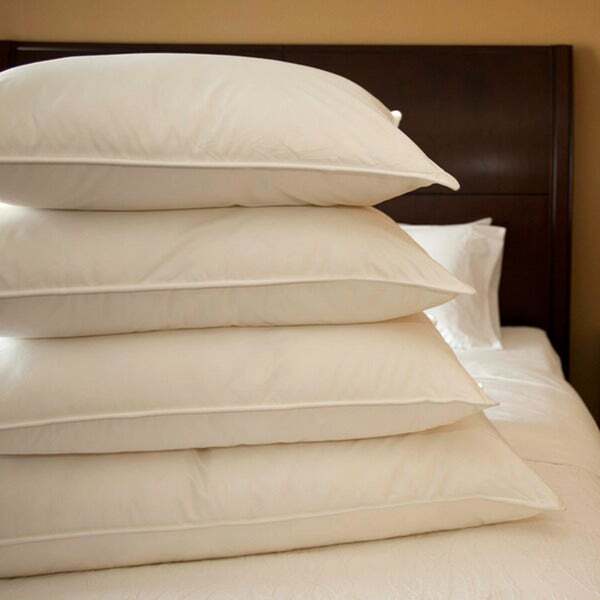 High quality down pillows use 600 and up premium down loft. You will see less expensive down items using 500 or even 550. However down loft - 600,700,800 etc., does not determine firmness. The number refers to the size of the down clusters that the pillow uses. An 800 pillow has larger clusters than a 600. Theoretically this means that an 800 pillow would rebound more quickly to its previous shape when a load ( your head ) is removed than a 600 pillow would. Also, theoretically, the down clusters would last longer giving the pillow a longer life. I've not tested that but feel that this pillow should have a long life and many people have used lesser pillows for many years. Plus if you re-fluff it in the dryer as I do you will be amazed at how this restores it. The firmness of the pillow is determined by the fill weight. The jumbo pillow I got has a fill weight of 28 ounces, many down pillows, even those called firm, will only have a fill weight if 18-21 ounces. Many manufacturers don't even disclose this number they just use the terms soft, firm, and extra firm. This makes it impossible to compare different pillows or even to have a good idea what you're getting leading to tedious product returns which is a problem with pillows. This pillow is an extra firm as I wanted. Comparable pillows from quality makers such as the Company Store, Down and Feather Company and others run about $200 for this level of down and fill weight. Of course some will be using a high quality and expensive thread count for the cover. That's very nice but I'm planning to sleep on mine not just look at its cover. I have pillow cases for that. Pillow choice is very personal decision, and because I had not found anything at a local retailer that satisfied me, I starting shopping online. I was very hesitant at first, because I felt I needed to touch a pillow before buying it. In fact, my very first test is to hold a pillow in the center with both hands. If I can squeeze the down and feel my palms touch, I know it isn't the right pillow. For this pillow, I was apprehensive because 600 fill power is the minimal fill power I would consider (previously I sought out 800 and 900 fill power), and the description does not indicate how many ounces of down are actually sewn into the pillow. Obviously, the higher the ounces, the firmer the pillow. When I received the pillow, the box revealed that it was a brand name, from a premium manufacturer of down products in the U.S. I did my palm test, and I was pleased with the firmness of the pillow - calling it 'Extra Firm' is accurate. The only thing that worried me, was the smell. Other specialty pillows that I've purchased online were not made until after they were ordered, so the amount of time that they spend in plastic is minimal. I am speculating that these pillows are made in advance, then stocked/stored until sold. The result is a faint plastic/confined odor. The packing list will advise you of this and suggest you let it air out a few days before use. It took four or five days for the odor to dissipate, but all is good now. Just don't expect to receive the product and use it the same night. I have already ordered and received another one, and the quality is consistent. I won't hesitate to get more. I was so happy to find this extra firm cotton 600 fill power white goose pillow. It is like sleeping on a fluffy cloud with nice firm support. One of the best pillows yet. Great, super-firm down pillows, which are nothing at all like a regular fill down pillow that goes flat immediately the minute your head touches it! This pillow is great - almost too full, although I think some of that effect is due to the extremely high thread-count fabric covering - but they're not so full that they come up around your ears like some extra full down pillows do (although those might be nice if you want to block out all sound and sleep with your head in a cocoon!). It's hard to even squeeze the air out of these! The latter is a problem only if you wash them, which I've done several times, and they've come thru just fine each time (with tennis balls in the dryer to fluff them) The only problem is getting the air out so they'll get clean all the way thru in the washer, as the fabric is so tightly woven that they kind of "balloon" in the water and just float around on top of it - the solution is to put them on a soak and spin-dry cycle to get the air out, and only then actually wash them. I use just a touch of the liquid soap that's made for washing WOOL and is very LITE (I don't think I'm allowed to use the brand name) but I'm that any liquid soap that's extra gentle and made specifically for wool will be just fine. I also never use liquid or powder fabric softener with down, as it can cause the down to flatten and stick together, and that's exactly what you DON'T want. Liquid softener, even if it seems fine at first, will eventually ruin your lovely pillows. On the other hand, fabric softener sheets that are made specifically for use in a dryer seem to be fine, as they don't affect the down - IF the fabric cover is as tightly wocven as these pillows are, but a looser weave could allow the softener to steam its way into the down, and again, that's exactly what you DON'T want. It's imperative that you then tumble-dry the pillows (or any down-filled item) or the down inside will mildew long before it dries! These pillows take a good 2 to 2 1/2 hours to dry in the dryer, even with the tennis balls in the dryer to keep them fluffing as they dry. You need to be absolutely certain that they are completely dry inside, or again, they will mildew. Or I believe that you can dry clean them (check the tags) but I've never tried that - I don't want that chemical smell in my pillows. And lastly, I've never tried the laundry scenting beads or packets with down, so I don't know how it might affect it. It's tempting to try it, but I'm not willing to risk ruining my lovely pillows. I just use a light spritz of a fabric freshening spray on them and then put thwem back in the dryer for about 5 minutes just to make absolutely certain that there's no dampness remaining from the spray. Hope this is helpful info! I am VERY particular about pillows. I have bought and returned several pillows over the past few years looking for the perfect firmness since I am both a side and back sleeper. I ordered two of these in the queen size and they are as near to perfect in firmness and loft that I believe I will ever get. They fluff extremely well with minimal shaking and are the firmest goose down pillows I've ever felt. They are still very soft and easy to melt into. Great buy for the price considering the amount of down in each pillow. Department stores usually charge 2 or 3 times as much for duck down pillows. In writing this, I'm actually thinking I should purchase a couple more to put away for later use. A very well priced item, for the amount of Fill Power and quality of the cover. If you want down and use an extra-firm pillow this is excellent. Nice and even distribution of the filling. Pillow is a tad heavy, but is what makes it extra-firm. I bought three well reviewed firm down pillows from the site with the idea that I would buy more of whichever one was our favorite, the rest will go on the guest bed. This one took second place. The quality is very good and the pillow is medium firm, not extra firm. The best and firmest of the bunch was the Tommy Bahama 600 fill French down. This is a good pillow if you don't truly need extra firm. I bought a down-filled pillow that was too soft and this one was soft but also had some firmness. I have purchased several down pillows from o.co this year and haven't been totally pleased with any of them until now. If you're looking for a firm goose down pillow, this is the one. Excellent quality. Hand down the best down pillow! I bought one, and was very skeptical because I have purchased more expensive down pillows and was unsatisfied. This pillow blew me away with how firm it was for being down. In fact, the maker of this pillow is the same as one I ordered from a very exclusive site that sells only high-quality items. I had ordered both around the same time, and promptly returned the non-Overstock item and then ordered three more! Love these pillows! I am a side sleeper and like a little bit of loft and firmness, which this pillow provides. I am very happy with my purchase. The tag on the pillow states that there are a max of 20% feathers, so it appears it is not 100% down. I would still buy it. Online description was 100% down, even the Q&A customer service stated 100% down. Unfortunately they are NOT 100% down, but 75% down and 25% feathers. Returned immediately, no problem whatsoever, Overstock customer service was great! These were described as perfect for a person who sleeps on their side. They gave me a neck pain because they are too high and hard. Noy the down pillow I have from other vendors. I have arthritis in my neck. Neck support is very important to my quality of sleep. I have always purchased top of the line from Macy's on sale; however this one is lighter and more firm (soft, but holds my head in place). I have had it about 3 months now. I imagine in a couple of months I'll need to run it through the dryer, but I see the difference already. Well worth the price if you can get discounts & coupons. This down pillow is okay. I needed a new pillow due to neck pain from the previous pillow; this one does the job. Unfortunately, "extra firm" is pretty soft to me. I'd like quite a bit more firmness. I purchased these a few years back and they were great. I have recently been shopping for pillows for my son and guest bedroom and have found myself back here looking to reorder these babies. Good pillows for the price. I have a terrible time finding the right thickness in a pillow for my neck. These are more supportive. Very good for company too. This is not a firm pillow. It flattens after a couple of days. I do fluff it up in the dryer but only stays fluffed for a couple of days. Not worth the high price I paid. These pillows beat any out there! For the price, you can’t beat them! Super comfy. I have had them for 4 years and they are holding up really well. I always get a good sleep with them. If we stay at a Hotel, we bring our own pillows. They are that good! These are very comfy pillow and thick. You fluff them once before bed and sleep comfortably all night. They are my favorite pillows. I need to get some more for my guest rooms. "If this pillow good for side sleepers? Thanks." These pillows are extra firm so should be fine for side sleeper. "The descriptions reads that these pillows are gusseted, but they appear to be knife edge in the photo. Can you clarify?" Hello wilmaf, these pillows are not gusseted, I apologize for the confusion. Thank you for shopping with us. "A person reviewing this pillow wrote: "The tag on the pillow states that there are a max of 20% feathers, so it appears it is not 100% down". Product description offers us: "Down, Goose Down, White Goose Down". What ACTUAL materials are used here? Why was this pillow sold as (apparently) 100 goose down yet customer received "a max of 20% feathers"???" Hello Good Night!, the Federal government has specific guidelines when it comes to how much down is in a product. The rule from the FTC states that to call an item a down something – it must contain a minimum of 75% down clusters – the remainder can be down fibers or small feathers, etc. The pillows are not 100% goose down. "Panchita asked if these where made in the USA. You replied that the country of origin is the USA, does that mean they are MADE in USA from scratch." Hello SageRunner, this item is manufactured in the USA. Please feel free to contact us again with any further questions. Thank you for shopping with us! Thanks! Just ordered two and am sure I will like them very much. "I purchased these pillows from Overstock.com in January of 2012 and have loved them. Wanting to replace them I have a question: Why has the price DOUBLED in four years? That seems very excessive and beyond my budget; I'm looking at my Overstock.com order confirmation from 1/14/2012 and the price for TWO Extra Firm 600 Fill Power White Goose Down Pillows was $174.93, including tax and shipping." Hello Sarah D., I'm sorry for the frustration we may have caused. We may have been having a sale on these at the time. You can sign up to be alerted when this item goes on sale if you like. This option is under the price. Called product alerts. If you have any other questions please let us know. Have a great day! "I need purchased pillows to be shipped to Miri, Sarawak, Malaysia. Is this possible? It is in East Malaysia." Hello Khoo, this item can be shipped to Malaysia. Visit the International section of our website and select the destination country. If applicable, Taxes, Duties and Shipping costs will be added during Checkout. Thanks for shopping with us. Hello Panchita, the country of origin is USA. Please let us know if you have additional questions. Thanks for shopping with us.